I like making things. Oh, and I like coffee... A lot. Great feedback here guys! Keep it coming. My iOS app TrooperTalk has a First Order Trooper preset w/ full customization for static, distortion, etc! Uh oh, four months and no progress!? Good luck, can't wait to see your progress! I'm loving the pack, been wearing it to every troop! I did, yeah. Used the Rustoleum Primer which also bonds to plastic, worked okay. Be sure to rub the blasters down with mineral spirits first otherwise the paint will never fully cure. Who can design it? I'll buy a few. From a troop this weekend. People are loving it! I agree a Jedha Patrol patch would be ACE! 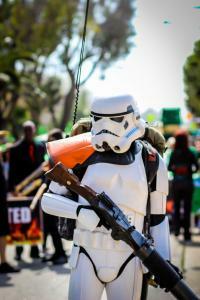 Been trooping in my pack quite a bit lately, loving it and getting lots of thumbs up from other troopers! Thanks guys! I have K-2SO and Finn FN-2187 Big-Figs on my desk now ready to get rocking and rolling this weekend. Going to take more/better photso tomorrow and I'll be starting on the Finn customization soon! Yeah, his customs are awesome! And here's the 6" Black Series figure for scale. This thing is massive! Hey guys! In the first of many planned custom figure makeovers, here's the Jakks Pacific 18" 'Big-Fig' Death Trooper! It was purchased from Target for $20 and reposed, repainted and set on a custom made base. The setting was based on Krennic's trip to see Galen Erso at the start of Rogue One, with his trooper attachment. I didn't take as many photos as I would've liked to along the way but here are a few that I happened to snap. Next in the pipeline is FN-2187 (Finn) during the attack on Jakku in Force Awakens, which will be done using this figure. My inspiration: Out of the box. Boring pose, soft details, just kind of meh. Great sculpt/detail though! A few hours, a dremel, some super glue, bondo and epoxy putty later, it's reposed! I wanted him to be standing ready, scanning the environment. Primer! Most of the painting detail done. Gloss for the armor, satin for the undersuit and other details. Weathering on the gun. And here's the final with the grassy base, including stormtrooper doll made from epoxy putty. The base was cut on a CNC out of MDF, dirt and wood glue were combined to create the surface texture and then brown plastidip spray paint was used to coat it and lock it all in. Finished with some black and dark brown washes and then drilled holes and stuck in the artificial grass reeds which were purchased from Michaels. I shoved them all the way through the base until they were at the right height and then cut them flush on the underside with a dremel. And here are the "product" shots! Look forward to your thoughts!